Yes, it has really come to that. Written for the Times newspaper by Michael Fallon, the Secretary of State for Defence, but no doubt inspired by Lynton Crosby, the Conservatives’ campaign manager, this is how the Conservatives decided to address the possibility that under a deal with the SNP, the Labour Party may sacrifice the renewal of Trident, our submarine-based nuclear deterrent. Let’s leave aside for a moment the idea that because David Miliband had the talent, work ethic and ability to be lucky enough to have been born first, meaning his brother had no right to stand against him according to some rather backward Tory thinking. Given the renewal of Trident will cost £100billion and commit the UK to many more years of having weapons of mass destruction at our disposal, I would hope for a far more nuanced and less childish debate to be happening over something of such importance. Sadly, this election campaign doesn’t really do nuanced and less childish. Trident is the name given to the programme under which the UK has four Vanguard Ballistic Missile submarines based at Faslane in Clyde, West Scotland. These four submarines have mean that every day over th past 46 years we have kept a ballistic missile submarine at sea every day. An Official government review two years ago claimed that there was no nuclear deterrent more cost efficient or effective as our Trident programme. The argument is that they guarantee our security against nuclear attack or nuclear blackmail. As long as we have a nuclear deterrent, no rogue state will launch a missile at us as we have the means for mutually assured destruction. There are 17,000 weapons across the globe. Russia and North Korea have them and Iran will very likely have them. So In order to protect Britain, and all members of NATO, the argument from both mainstream parties is that we need to continue to have them as well. Unilateral disarmament would remove us from the top table at NATO and probably the UN Security Council too. The SNP policy is simple. They want to unilaterally disarm the UK. There is nowhere else in the country set up to hold the Trident submarines, so we would be effectively disarming by removing them from Faslane. The SNP don’t see a problem with that. They argue that it would ‘set an example’ to the other nations if the UK disarmed first. They argue thG someone has to lead the way and it is their belief that it should be the UK first. Philosophically it makes sense, and it is very popular with many people. In the article, Fallon called this ‘student politics’. The reasons for that is, like many SNP policies, it assumes that there are no possible negative consequences to their actions. Just as assuming if you became independent you could demand a currency union with the rest of th UK was naive, thinking that if the UK disarmed then others would too is also naive. Yet, Deputy leader Stewart Hosie pointed out that part of the reason other countries had nuclear weapons is because the West have them, and so other countries outside the West feel they need to have them in order to ‘defend themselves’. That could be true, but it would be a massive risk to find out. Questioned by Andrew a Neil on “The Daily Politics”, Hosie was also unable to explain why it would be Ok for the UK to unilaterally disarm but still be protected under the nuclear wing of NATO. Hosie did point out that there are plenty of members of NATO without nuclear weapons, but Neil was pushing on the point of why NATO should be prepared to continue to defend a country that had basically said “here, you defend us, we are going to rid ourselves of the ability to defend ourselves”. Ultimately, Hosie and the SNP are, it seems, comfortable with being part of NATO and its nuclear deterrent. It not to contribute. A continuation of their general pro-cake and pro-eating cake appraoch to politics in this election. Which brings us back to Ed Miliband, Labour and the SNP. Fallon writes that “Nicola Sturgeon could not be clearer. 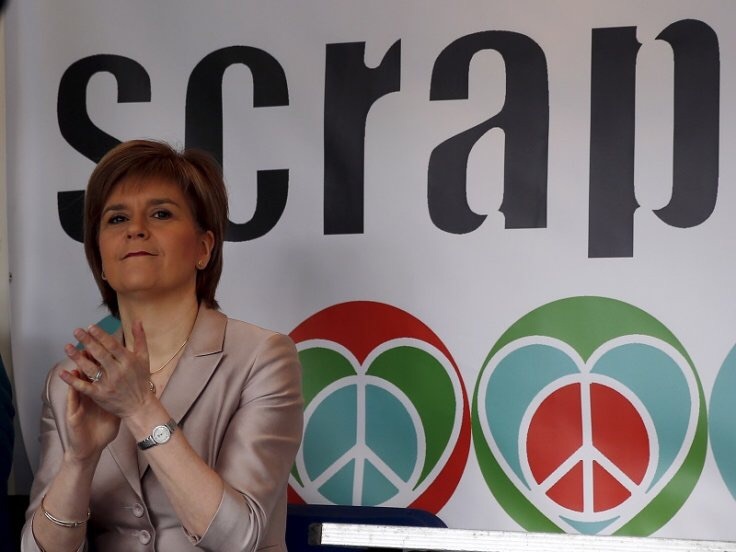 She has told Ed Miliband that scrapping Trident — our country’s vital nuclear deterrent — is non-negotiable. If he wants the keys to No 10, he must abandon any plans to renew our current Vanguard ballistic missile submarines.” This is just patently not true. I am going to assume that Michael Fallon and the Conservative Party know full well that it is perfectly possible for the SNP to vote against any budget that includes Trident without bringing down a Labour government. All Labour has to do in negotiations with the SNP, which will as it stands only be on a vote by vote basis, simply agree that they will push to renew Trident (which would get through as it would be supported by the Tories, and let’s not forget a Labour has been more pro-renewing Trident than the Tories in the past) and not rely on the support of the SNP, whilst relying on them for the Queen’s Speech and Finance Budgets and votes of confidence. As the SNP are having to remind people a lot, the Fixed Term Parliament Act had changed how these agreements can work. For the stories to be pretending that they don’t know that is misleading at best, mendacious at worst. Shame on them.